A fiberglass version of William Atkins THISTLE (1934). In doing the conversion to fiberglass, William Crealock said that he kept the basic lines, while raising the sheer and redesigning the rig. The builder, Larry Kendall, only produced a few boats, before he sold the molds and tooling to Westsail Corp. in early 70's. The remainder were built by Westsail. 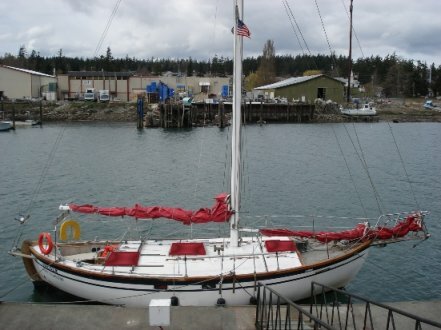 With some design modifications by Crealock, it became the WESTSAIL 32. Thanks to 'Gitanecrew' for corrections on this model. Additional information from Oljai Oztoprak, owner of KENDALL #1.